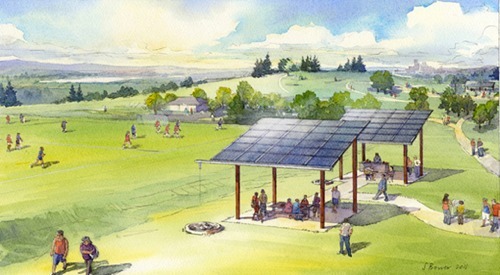 Illustration by Stephanie Bower; image courtesy of Seattle City Light. All are invited to come out to Jefferson Park on Wednesday, March 21 from 9:30 a.m. until noon to be among the first to see the new Community Solar picnic shelters at the Park. Local dignitaries and representatives of Silicon Energy, the company who manufactured the solar modules that make up the roofs of the shelters, will be on hand to celebrate the grand opening. The Jefferson Park project is estimated to produce 24,000 kilowatt-hours (kWh) of electricity per year, enough to operate 3 households. In the Community Solar program, Seattle City Light customers have the opportunity to enroll in the program as founding members by purchasing “units” of solar power for $600 each. Members then receive credits to their electric bill, using the power generated by their portion of the project. See more about it here. Members will also have their names included on the shelters: “artistically inscribed on colored metal bands surrounding the structure support columns,” according to City Light. Wednesday’s weather forecast currently calls for rain, so the solar part of the project might not get too much of a workout. The shelter part ought to come in handy, though. Architecture and engineering by Nic Rossouw of giraf design. Solar components from Silicon Energy.